belzberg architects is an architecture firm located in the city of santa monica, california. the firm was founded by hagy belzberg, and has won many national and international awards. santa monica based office belzberg architects has finished the design of the new los angeles museum of the holocaust (LAMOTH). now open to the public, the museum features an undulating green roof that pulls up the northwest corner of los angeles’ pan pacific park. 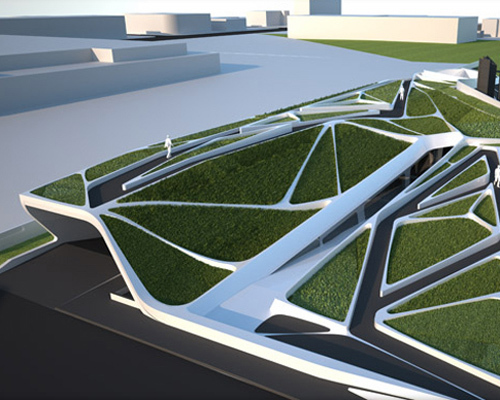 serving as an annex to the already existing holocaust monument, the multi-cultural museum aims to integrate completely into the public green space, minimizing the visual impact on the park’s atmosphere. the roof, while subtle in height, features graphic lines of concrete that divides the surface into a series of zigzagging pedestrian paths. slicing through the center is the descending entry ramp, which tapers in to an interior space that is flanked by sloped ceilings and perspective-altering floors. the design of the layout and circulation kept conscious the institute’s 50 year history, utilizing the building’s underground elements to evoke certain emotions from the visitors. clever usage of natural light from above alleviates the darkness and compressive atmosphere provided by the shotcrete columns. those columns make my knees melt. Zaha indeed and yeah, the render looks cooler ! love the columns, but the framework is just out of place! couldn’t find some decent solutions, perhaps accordingly with the building? where is the location ?really amanzing! appears to be more a product of digital technique than anything. It’s not clear in the explanation, nor can one discern how the formal qualities of the building are in dialogue with such a culturally/historically charged building concept. right, somehow the built photos don’t quite match the renderings… those construction workers must be incompetent idiots. it’s all their fault.